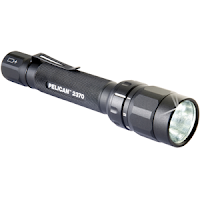 We love Pelican Cases.. they are easy to use, durable as heck, and guaranteed for life, and face it.. they are pretty cool looking..
Well Pelican also makes flashlights and they just released a cool new flashlight that has been designed as 3 lights in one. 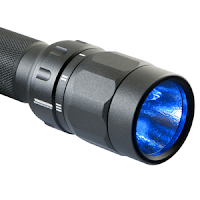 A rotating magnetic dial switches between bright white light (106 Lumens) and night vision red or blue light (13 Lumens), so the 2370 LED is the only light you will need, whether backstage at a theater, on a film set, even piloting an aircraft, or navigating a park trail at night. The anodized aluminum body is strong and light weight while the removable strengthened steel clip fastens securely to your pocket. The new 2370 LED: It keeps you dialed in to the action. You can get it at your local Barbizon office or online on our website.